MARK TWAIN'S MISSISSIPPI - The upper reaches of the Mississippi River are rich with frontier tales of fur traders and pioneers set among picturesque geography and abundant wildlife. The region reflects the spirit of the people who worked this land even before steamboats came to the river. As Mark Twain once said, "there are all the enlivening signs of the presence of active, energetic, intelligent, prosperous, practical nth-century populations. The people don't dream; they work." Farming, fur-trapping, lumbering and mining were at one time the lifeblood of this region. As hard as the river and the region has been worked by its people, its scenery remains enchanting and largely unspoiled. 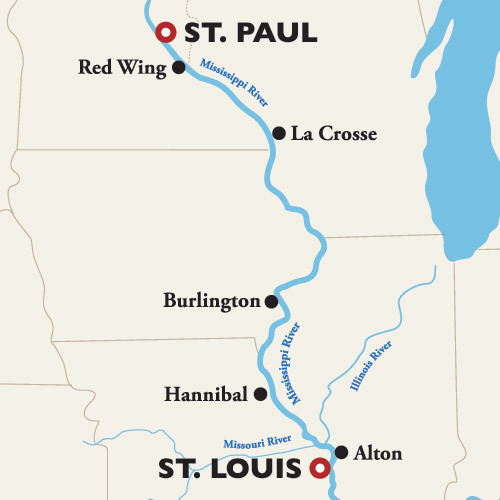 Twain's Life on the Mississippi describes this area as a paradise and you will experience it for yourself as hidden gems around each bend of the river fuel your sense of discovery and the very best of America's heartland unfolds before you.